The Left 4 Dead franchise was one of the defining reasons for the rise in popularity of co-operative multiplayer shooters during the previous generation, and looking back on things, it’s kind of crazy to think that neither instalment ever made its way onto the PlayStation 3. However, the genre has taken a bit of backseat in recent years, and with Valve refusing to release a third entry in any of its series, the baton is passed down to other creators in an attempt to emulate the experience. 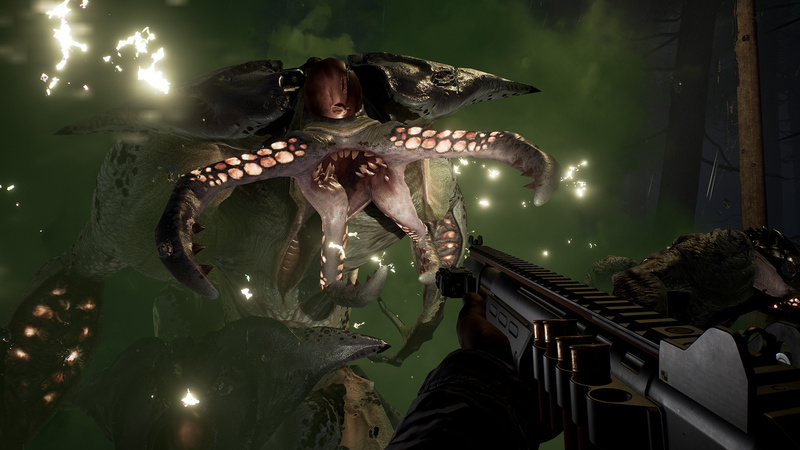 Developer Holospark is aiming to pick up those pieces with Earthfall, but can it replicate those fond memories of the late noughties? Following a meteor strike, an alien race has invaded Earth and taken over. Playing as one of four different characters, it’s up to you and your team to take the fight to the invaders and form a resistance. Communicated across 10 scenarios that are split up into two different campaigns, you’ll perform a series of menial tasks in order to work towards a greater objective that will conclude the level. 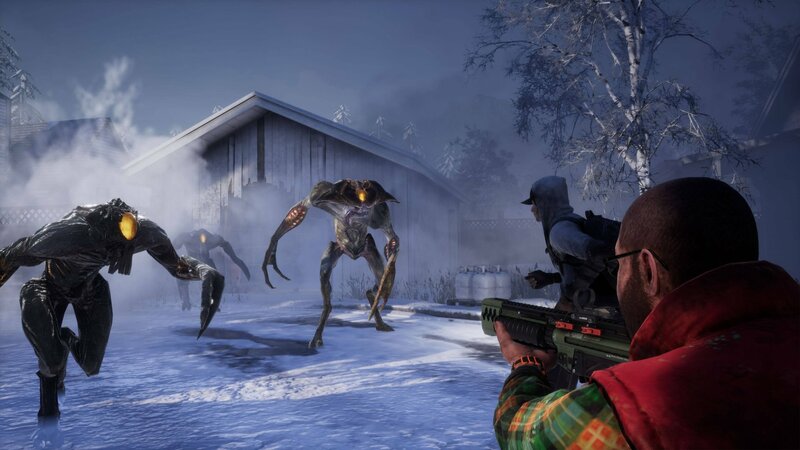 Told from a first-person perspective, you’ll work together to accomplish these goals while slaughtering any other-worldly creature that crosses your path. It’s a very basic structure, and it’s this simplicity that can be found under every nook and cranny of Earthfall, to its serious detriment. Just take the aforementioned story for example, every detail and revelation is located in a Lore tab off the main menu screen. None of it can be found actually in-game, to the point where you’re asked to scan objects found in the world and then given the option of reading up on them later on once the mission has concluded. It’s a poor way of revealing the plot to the player, and it resulted in us giving little to no care for what was happening around us. Gameplay doesn’t pick up the slack either. There’s very little variety in the objectives you’re given, with most asking you to simply interact with machinery or objects via a hold of the circle button. You’ll also find yourself escorting a payload in the form of a van and a mine cart, scavenging fuel to power a generator, and defending a point on the map, but these switch ups don’t do anywhere near enough to keep proceedings engaging or even entertaining. 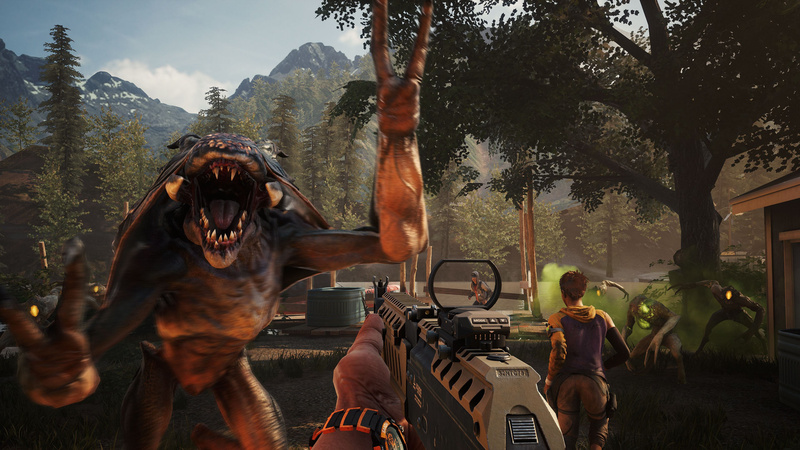 To boil it all down, Earthfall’s gameplay loop consists of interacting with a lot of objects via a button hold, and killing a lot of enemies. We suppose the simplicity of the objectives could be somewhat forgiven if the act of taking on an alien army was a fun foray, but unfortunately that isn’t really the case. 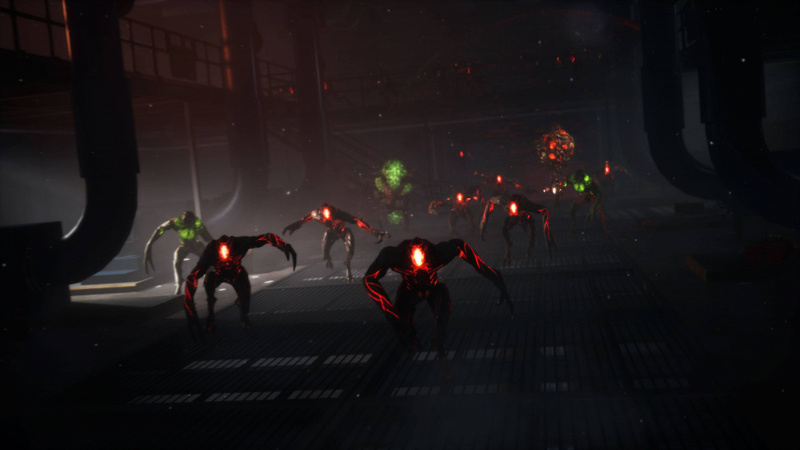 Fodder enemies come in the form of drones, with light and heavy variations, and then there’s the more unique foes that come with a bigger threat. Among others, Sappers are full of toxic gas that need to be dealt with quickly in order to avoid breathing in too much of its fumes, the Whiplash will grab you and run away, separating you from the team in order to devour you, and Blackouts teleport across the map while firing laser beams at you. The amount of adversaries on-screen at any one time reaches a fairly satisfactory standard, but what you come equipped with doesn’t do your kill count any justice. Basic weaponry is on offer, from dual-wielded pistols, assault rifles, and shotguns, to sniper rifles and melee weapons, but none of them feel good to shoot. Every gun feels weak, lacking any oomph or pizzazz. They do all get the job done, but you’ll never withdraw any satisfaction from a well-placed shot. One thing that Valve’s zombie franchise was always praised for was its horde mechanics and the randomness attached, which would always keep you guessing on subsequent playthroughs. This isn’t the case here however, as the alien horde present appears to be fairly scripted with only certain places that they can spawn. Most of the time they’ll appear from a foggy tree line or climb over a wall to make things appear to be fairly organic, and then sometimes they’ll spawn directly in front of you. We witnessed with our own eyes a parking lot go from deserted to bursting. It completely breaks the atmosphere when this occurs, and while rare, it’s yet another feature that pales in comparison to the original experience Earthfall is trying to replicate. Every one of the 10 skirmishes on offer can be played solo with bots or online with up to three friends, and it’s here where the game is going to live or die no matter what your opinion is of its quality. If there’s nobody online to play with then the match will be filled with AI characters, and while they do a decent job of staying alive, they can’t replicate a live person. If this does happen, you’re left with 10 levels that take no longer than 20 minutes to complete, meaning you can see everything the game has to offer inside four hours. During our time with the title, we continuously searched for an online match across its first weekend on sale, and we weren’t matched into a single lobby once. Of course this is just our experience, but take that into account when combined with the fact that this is a full priced retail release, and we can’t exactly paint a rosy picture for the future of the game. Performance wise, things don’t fare any better. 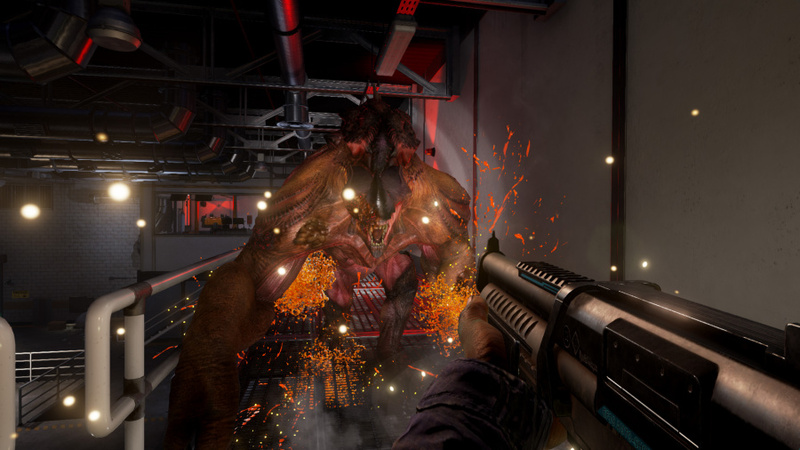 The framerate takes a nose-dive when there’s multiple enemies on screen, even on the PS4 Pro, and consistent texture pop-in means that Earthfall is neither a game that’s enjoyable to play or to look at. Graphics also look washed out, to the point where they could pass as a late PS3 game. 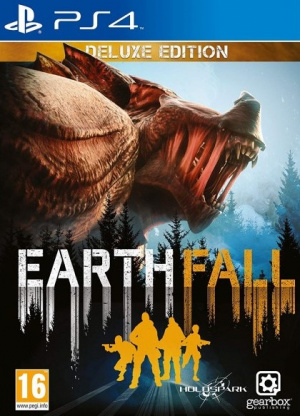 There’s still a lot of potential to be realised in a Left 4 Dead-like experience, but Earthfall is a complete miss. It fails to build upon the foundations abandoned by Valve, with repetitive AI spawns and an arsenal of weaponry that does nothing to distinguish themselves from one another. And with just four hours of content to work through, you’ll be left feeling short-changed by an experience that gives you no reason to return once the credits roll. Fair to say this is an Earth...fail? This is a wait for $5 sale so you and a friend can have a Saturday night jam session. Production values look okay to me, but...can't ignore all the bad scores this game's been getting. I actually kinda like this game. I went straight to see the score it was given. Now there's no need to read the review. This is a Games Pass game lol. Yikes! Not much of a "deluxe" edition.